The Internet is registering an initial impact on everyday life in America. Nearly all Internet users go online to conduct some of their ordinary day-to-day activities, from mundane tasks to social arrangements to personal recreation. Furthermore, online Americans report their Internet use affects the proportions of these affairs in their everyday lives. 64% of Internet users say their daily routines and activities would be affected if they could no longer use the Internet. 53% of Internet users say they do more of certain everyday activities simply because they can do them on the Internet. The most popular are communicating with family and friends and looking up information. People both admire and use the Internet as a tool for conducting their everyday activities. The vast majority of online Americans hold a high opinion of the Internet as a place to conduct the everyday tasks and pursue the everyday pleasures of life, such as checking the weather, doing their banking, communicating with friends and family, and playing games. Over the course of the four years in which the Pew Internet Project has been tracking online activities, a growing number of users have acted on their positive opinions of the Internet and gone online to do these things. 92% of Internet users say the Internet is a good place to go for getting everyday information. 85% say the Internet is a good way to communicate or interact with others. 75% say the Internet is a good place to conduct everyday transactions. 69% say the Internet is a good way to entertain themselves in everyday life. Throughout this report, we present percentages of “Internet users who do an activity online.” To be clear, we calculated these percentages based on only those Internet users for whom an activity is relevant. That is, we made our calculations based on the percentage of Internet users who undertake that activity somehow in their everyday lives – either offline or online, or both ways. For example, of all Internet users in this study, 53% of them check sport scores somehow in their everyday lives, while 47% of them never check sports scores. Therefore, when we then report that “55% of the Internet users check sports scores online.” we are referring to 55% of that subset of the 53% of Internet users who ever, somehow in their everyday lives, check sports scores. 87% of Internet users who ever use maps or get driving directions do this online. 69% of Internet users who say they get weather reports get such reports online. 63% of Internet users who say they get news in their lives get news online. 55% of Internet users who ever check sports scores in their lives get such information online. 50% of Internet users who ever look up phone numbers, addresses or zip codes in their lives get such information online. 79% of Internet users who say they communicate with friends and family use the Internet for such communications. 52% of Internet users who exchange greetings, cards and invitations go online to do so. 46% of Internet users who say they ever plan gatherings and arrange personal meetings use the Internet for such purposes. 26% of Internet users who ever plan meetings with new people or dates use the Internet for those purposes. 55% of the Internet users who buy tickets for movies, plays and sporting events do such activities online. 44% of the Internet users who say they do banking and bill paying use the Internet for those purposes. 33% of the Internet users who ever purchase everyday items go online to buy things such as books and groceries. 22% of the Internet users who schedule appointments and meetings use the Internet for such purposes. 46% of the Internet users who ever play games do so online. 34% of the Internet users who say they have hobbies go online to pursue their hobbies. 23% of the Internet users who say they listen to music or radio regularly do so online. 18% of the Internet users who say they read for pleasure will read online. 16% of the Internet users who watch videos, movie previews, or cartoons do so online. The integration of the Internet into everyday life doesn’t match its popular appeal. Most Internet users still default to the traditional offline ways of communicating, transacting affairs, getting information, and entertaining themselves. Two different measures suggest that, overall, the virtual world of the Internet still takes second place to the real world as the place to accomplish daily tasks or enjoy recreation. First, among the many Internet users who toggle between the offline and online worlds for activities, most use the “real world” alternative rather than the online alternative. For example, Internet users buy movie tickets more often at the box office than buy them online. Second, when Internet users do a certain activity exclusively in one realm, more will still do it exclusively offline than exclusively online. For example, among Internet users who ever look for sports scores, almost twice as many will look for them exclusively offline as exclusively online. Of Internet users who ever look up addresses or phone numbers, many more will use phone books than online sources to get this information. 45% of Internet users who ever get the news get it both online and offline. Of that group, 22% access news more often online; 71% get news more often offline from places like newspapers, radio and TV. 27% of Internet users who ever purchase tickets do so both online and offline. Of those 38% buy tickets more often online; 57% buy them more often by phone, mail, or in person. 26% of Internet users who ever do banking or pay bills do so both online and offline. Of those, 34% do it more often online; 54% do it more often in offline. 17% of Internet users who ever get the news, get it online exclusively; 38% get it offline exclusively. 28% of Internet users who ever purchase tickets, do so online exclusively; 45% do it offline exclusively. 20% of Internet users who ever do banking or pay bills do so online exclusively; 56% do so offline exclusively. 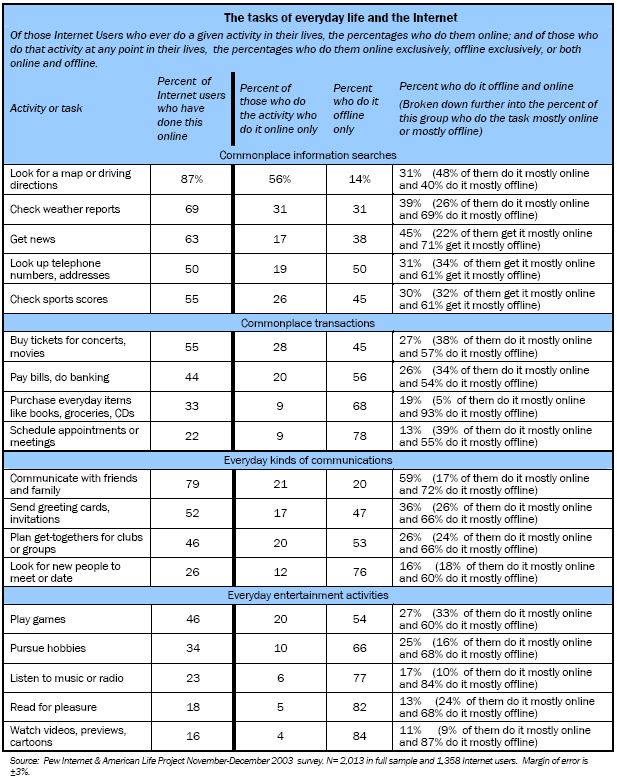 From among the 18 different everyday activities we measured in this survey, there is a single exception to this pattern of preference for the offline world. Among Internet users who look for maps or driving directions, 56% do it exclusively online and 14% do it exclusively offline. Among the 39% who do it both ways, 48% say they do it more frequently online, and 40% say they do it more frequently offline. Otherwise, the story is that the offline world still is preferred to the online world for many activities related to daily living. The responses of online Americans suggest that the Internet is a better tool for accomplishing some everyday activities than others. The Internet is most popular when its efficiency comes into play. The emerging story of the Internet in daily life is the where and how of its use. The nature of our multi-channel world means we can communicate in many ways – by email, phone, letters, face-to-face meetings, and instant messages. And we can gather information from many sources – Web sites, books, newspapers, television, and radio. The pattern of responses in this survey is that people pick one channel or another depending on both the nature of the task and the circumstances of the moment. Users turn to the Internet most when it offers advantages in speed, convenience, time, and other measures of efficiency. One of the most popular Internet activities, looking for maps and directions, collapses several tasks into one simple, elegant application. Anyone who has used the uncomplicated and effective application for finding driving directions online knows how superior it can be to the often clumsy and time-consuming experience of doing it offline. Further, given that most Internet users are more mobile than their Internet connections are, a lot of daily activities still depend on where people are. For example, reading a story in the newspaper might be more convenient on the bus to work, while reading that same story online at a desktop computer might fill the need for a break during a busy workday. Polling of everyday activities shows that the most popular ones share the characteristic of being efficiently done on the Web: getting maps or directions; communicating with others; checking the weather, news and sports scores; buying tickets. A leading edge of Internet users – 30% of the online population – integrates the Internet into everyday life in a richer and more thorough way. In past research, the Pew Internet & American Life Project often found a leading edge of Internet users who behave differently from the rest. Demographically, this group is often better educated, of higher income, and has spent more years online than other Internet users. In this report, such a group of users integrates the Internet into everyday life in a much more engaged and richer way than others. It is likely that they are blazing a trail that others will follow. 30% of Internet users say the Internet plays a major role in their everyday lives. Compared to other Internet users, they do more everyday activities online and they do them online more frequently, and they are more likely to do them exclusively online. Different demographic groups of users integrate the Internet into everyday life differently. Men are more likely than women to use the Internet more for information gathering and entertainment. Women are more likely than men to use the Internet to communicate. Young people are more likely than older Americans to have a more positive attitude about the Internet, in particular thinking it is a good place to go for conducting transactions and for entertainment. Older people are more likely than younger Internet users go online to interact socially.